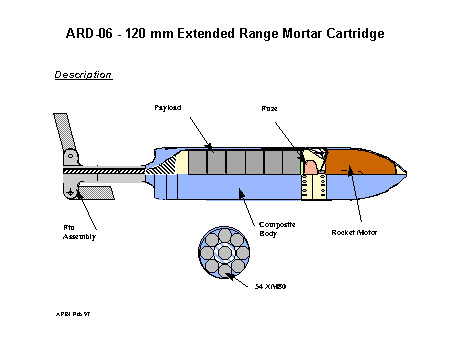 The M984 120 mm Extended Range DPICM Mortar Cartridge [ERMC / ER-DPICM] effort is demonstrating a generically configured 120 mm extended range mortar cartridge which can deliver a variety of payloads, including cost-effective anti-materiel / antipersonnel sub-munitions, enhanced screening and multi-spectral smoke, white and IR illumination, countermeasures, sensors, and other potential non-lethal munitions to ranges 50% greater than currently obtained (7.2 km). The XM984 is an Army technology-based initiative which responds to a user need to extend the performance envelope of US Army heavy mortar systems by providing battlefield survivability via greater range capability, increased lethal effectiveness, and reduced logistical footprint. The XM984 provides greater battlefield operational flexibility through the ability to more effectively support rapidly maneuvering forces without imposing an additional logistical burden. The development and subsequent fielding of the XM984 provides an Infantry Battalion with the ability to effectively engage and defeat deeper and more numerous enemy targets. This low risk development effort uses available advanced technologies to extend the performance envelope of the 120mm M120/121 heavy mortar systems. The XM984 provides over 50% increase in maximum range capability, 233% greater single weapon area coverage, and a four-fold improvement in effectiveness as compared to the current 120mm M934 HE Cartridge. Extended range capability (12km) is provided by the use of a high-performance, advanced, post-launch tractor type rocket assist propulsion unit. The application of a tractor rocket motor in lieu of a conventional rear tandem motor minimizes potentially deleterious aeroballistic destabilizing effects of rocket motor gas effluent acting on the rear stabilizing fins, and permits optimal locating of a multifunctional electronic fuzing assembly. The embedded, multi-functional electronic fuze provides for effective, reliable rocket motor ignition and reproducible payload expulsion replication. The cartridge structure utilizes high strength, lightweight composite materials which permits maximum utilization of available volume for payload. The predicted effectiveness has been derived from XM80 arena and pit fragmentation testing in conjunction with subsequent aeroballistic and effectiveness analyses. The predicted precision for the XM984 is 1% in range, a value comparable to that currently attained. Since area coverage (pattern) can be readily varied by appropriate fuze settings, little effect on effect anti-personnel/anti-materiel effectiveness is anticipated. The physical configuration of the projectile capitalizes on previous technology based efforts including 155 mm HICAP and XM982 projectiles.